Hey everyone I’m FergaTroid and welcome to this of review game dev story is this a good game or a bad game? Let’s find out. 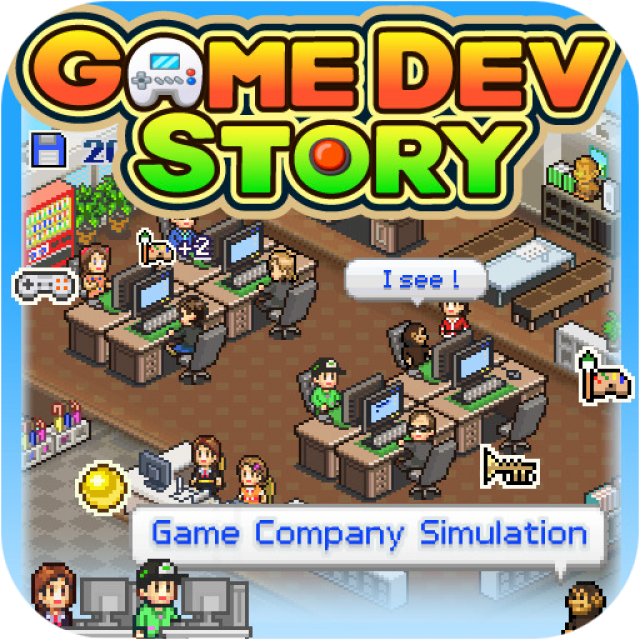 Game Dev Story is a simulation video game developed and published by Kairosoft for iOS and Android. It was released on October 9, 2010. 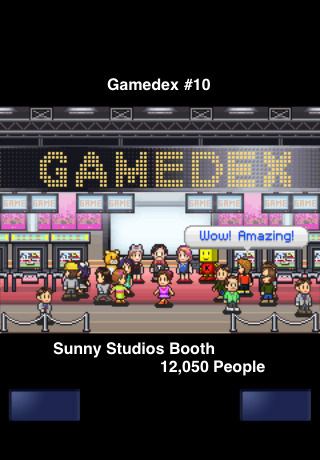 The game follows a video game company and its attempts to expand into a sales powerhouse over time. 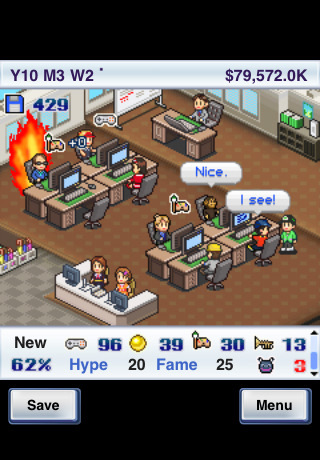 As a simulation, the game and the direction of the company is controlled by the player, following a parallel timeline of the video game industry and its history. The player takes control of a start-up indie video game developer, with the goal of making hit titles and eventually consoles in order to make money. The user controls a number of factors which can help or hinder the quality of the games released, including hiring staff, controlling the direction and speed of development, and using items which give boosts for workers or change their jobs. 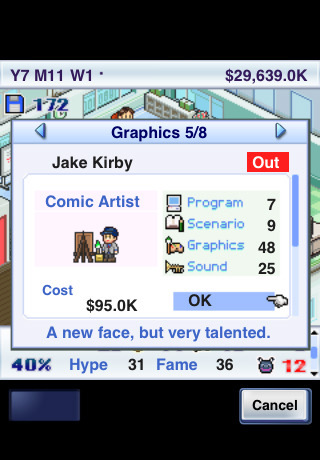 As the player progresses and earns more money, their building is improved upon and they are allowed to hire more staff, and thus create better games. Games are assigned review scores upon completion of a game ranging from 1 to 10 with a comment from the associated reviewer with his score. The scores generally affect the sales that go along with the game, and as they are in real life, sales are ranked with a number according to how they sold that week. As the game progresses there is little if no evolution to the gameplay as this game was obvious polished for the first 10 years of making games and little else. At the time of writing I have 28 years under my belt and 800 million in my back pocket ready to spend but with nothing to spend it on. I’ve made 2 consoles and have 17 games in one franchise. Because of this the later years of no challenge the game quickly feels grindy. And why do I have to release a game in 3 months can’t I pull a valve and make people wait 7 years building a super-game. I played it on the iPad and there are a good few inches of screen real estate not being used. 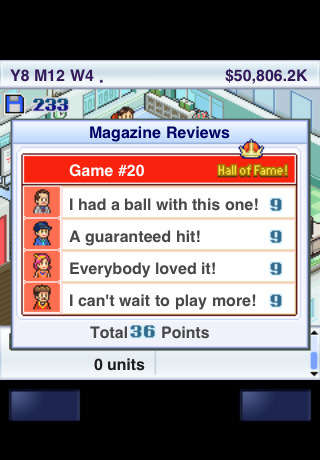 Another weird feature is that to make a sequel to one of your games it needs to rate on average roughly 8 or higher. But in reality when did low scores ever stop developers and publishers making sequels to their shithouse franchise cough, cough, cough, NBA live franchise. I think I didn’t play this game right because the way it was probably intended to be played is to have been played in short bursts. Game dev story is a decent game because of its fun premise but it’s let down by gameplay that doesn’t really evolve past the first few minutes of gameplay. Game dev story gets two and half stars out of five.